CARVE OUT YOUR NICHE.. and do it with style. Take your website to a whole new level! 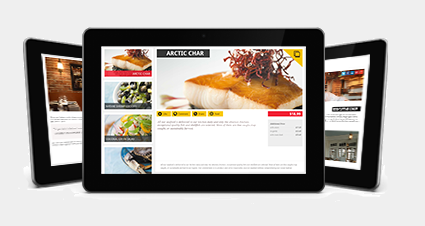 Tab-K is Tablet based E-menu that can completely transform the dining experience of guests in any restaurant. Guests can view the pictures of various dishes, read details and place the order directly to Kitchen. Swayam - A cloud based platform, enables every retailer to make android based kiosk with a personalized look and feel. In minutes you can upload pictures of your products, write description, select skin, colors, theme etc. I created an interactive kiosk for my bakery using SWAYAM web based tool and my customers can see all the items on a android device that I have mounted on the wall. I save a lot of time and customers are also happy. Thanks to sankiosk Electronics for this freeware. We used to keep catalogs for customers to show them the stock of Jewellery. Printing them again and again new arrivals was very painful.We registered our store with SWAYAM and created an E-catalog. Each time new designs arrive, we just log on into the SWAYAM web application and update the pictures and details. Customers find us trendy when we give them the touch screen based device instead of a Paper based catalog. Thanks Sankiosk!